Of course an encyclopedia article only gives you the facts and can barely scratch the surface of a person’s personality. Siri gives a much more detailed look into her mindset in her autobiography “Awakening: From the Depths of Self-Doubt to Winning Big and Living Fearlessly”, co-written with Julia Beeson Polloreno, Triathlete Magazine’s former Editor-in-Chief. Of course Siri covers her amazing career. But while it’s interesting to get Siri’s inside perspective on her greatest races both as an athlete and as a coach, the book really shines when Siri describes the challenges in her life and how she deals with them. The first quarter of the book describes how Siri grew up, having to deal with a stepfather she never felt comfortable with (“a dark, ominous cloud”) and the emotional turmoil he created in her life. Her mother tried to do her best to juggle the demands of her new husband with the needs of her children, but it was sports that helped Siri to find herself as a young adult – because she found coaches and friends that helped her find trust in herself. Siri describes a number of her coaches and what they mean to her – starting with her high school lacrosse coach Renee Spellman: “I still don’t fully understand what inspired her conviction and faith in my potential. She took every opportunity to build up my confidence and develop my character. 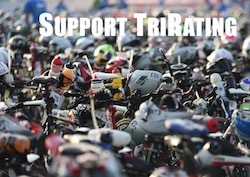 She saw a sad, scared kid and cracked me open to let out a little light.” She found more coaches and mentors once she picked up triathlon – including Brett Sutton who challenged her in a lot of ways: “Every day, Brett would give me an impossible task, and somehow I would manage to get it done. I’m starting to feel I’m capable of so much more than I ever thought.” Even if she struggled with doubts and injuries and missed reaching some important goals such as qualifying for the 2000 Olympic Games, she eventually gained the confidence in herself to go for the triathlon World Championship title – reaching her goal in 2001 and then continue to be the #1 ranked athlete for 2002. To me, following Siri’s growth path beyond the bare facts of results lists was fascinating and a great read. I hope it’ll encourage her readers to strive to win big and live fearlessly – and to define what that means for them personally. 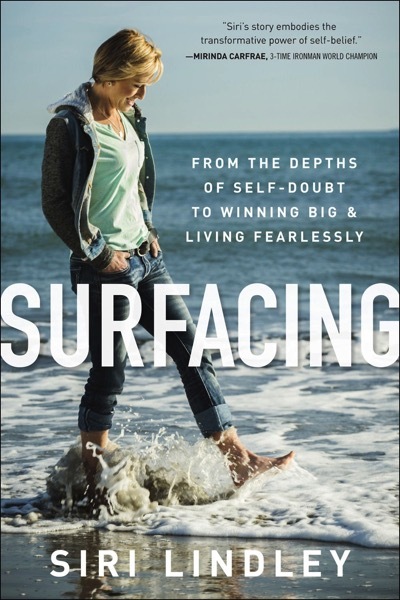 “Surfacing” is available as a hardcover in US book stores and on Amazon (affiliate link). It’s also going to be available internationally (release dates for the UK and Germany are set for early November) and eBook versions are prepared as well.